iOS 10 introduced support for rich notifications: they can now contain custom content, such as images, videos, sounds or even a fully custom view controller. Batch 1.6 comes with built-in support for these, but due to the way they're implemented, integration of a supplementary SDK is required. Don't worry, we've made it really easy. Note: This tutorial assumes that you haven't already added a Notification Content extension. If you do, jump straight to Integrating the Batch Extension SDK. You'll require Xcode 8 or greater to perform this integration. 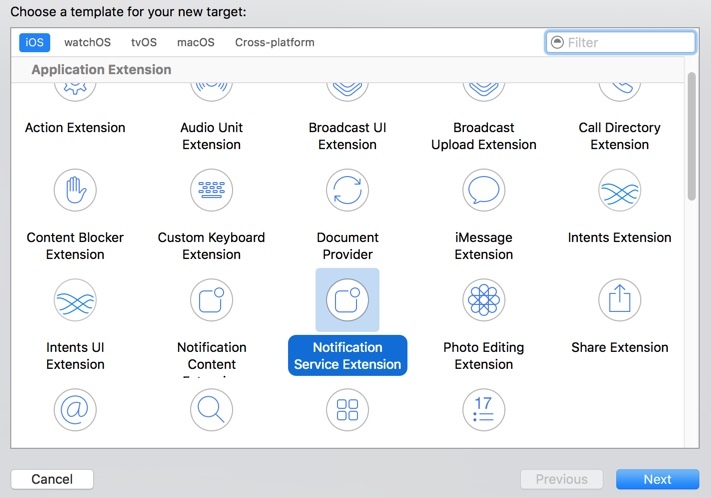 In order to set up the Batch Extension SDK, you'll need a notification service extension. 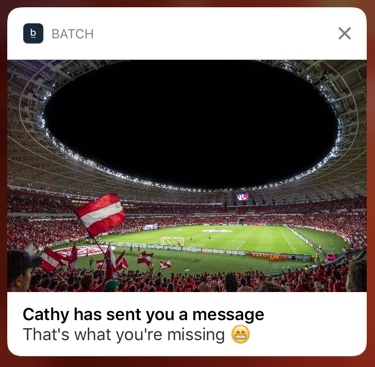 It's a standard iOS component that will take care of downloading rich content and add it to the notification. Open your Xcode project, click on the File menu and then pick New -> Target. Then, pick Notification Service Extension and fill in what's left of the wizard. You can name the extension as you wish: we will name it RichNotificationsExtension for the rest of this tutorial, and write it in Swift 3. Xcode will then ask you if you want to activate the scheme. Press Activate. Check Copy items if needed, make sure that your extension is selected as a target and finish the wizard. Open the project from the sidebar, pick your main application target, and select the Build Phases tab. This step is required to work around a Xcode App Store submission bug with universal frameworks. Note: If compilation fails, make sure you added these two steps to the main application target, and not the extension. That's it, no code to write! Start your app, and try sending a rich push from the dashboard. 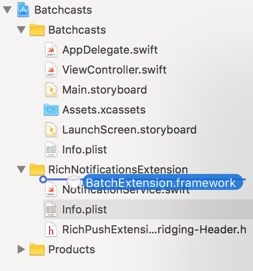 If you've already added your own extension code, you might want to manually integrate Batch and perform your own modifications to the notification content. Then, instanciate a BAERichNotificationHelper instance, and keep it as an instance variable of your UNNotificationServiceExtension instance. Note: You must NOT instanciate a new BAERichNotificationHelper object every time. The class needs to keep an internal state, and might not behave properly if it cannot. appendRichData, which will download and add attachments to the content, and call you back once done.